Adapt9S12E256 is a compact, modular "AdaptS12" form factor board, compatible with an entire range of application cards, prototyping cards, and backplanes, and usable with solderless breadboards ("proto boards"). 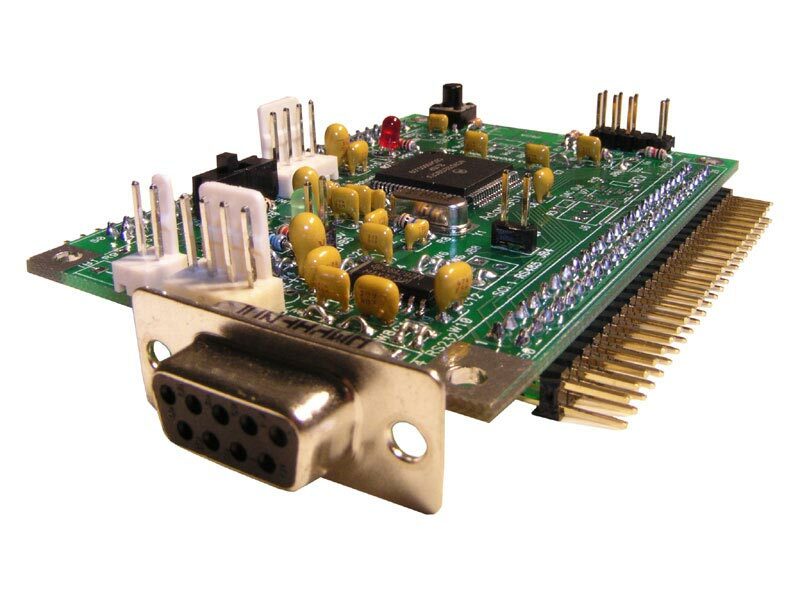 The Basic configuration includes all necessary support circuitry for the MCU, including a 5-Volt regulator, 8MHz crystal, reset button, BDM connector, and RS232C interface. Accommodation for a user-supplied precision voltage reference is also provided on-board. With a 2K Flash-resident debug/monitor program, you'll be able to load your program into the remaining 254K Flash via the serial port using our uBug12 user interface for Windows. The entire 254K Flash can be programmed in about 20 seconds! To use the monitor for debugging or code-loading, just set the switch to LOAD. To run your standalone program thereafter, leave the switch at RUN. Your code runs from Flash, and interrupts are supported (via Flash-based pseudo vectors, since the monitor resides in the vector space of the MCU). A program you load into Flash this way will run every time you apply power or reset the board in Flash Mode. If you want to take advantage of a more advanced development tool (such as uBDM12LX5), the entire 256K Flash can be used, because the Flash-resident bootloader is no longer needed. Use of a BDM pod will also enable you to load and run code from an optional external RAM card, supporting unlimited software breakpoints.